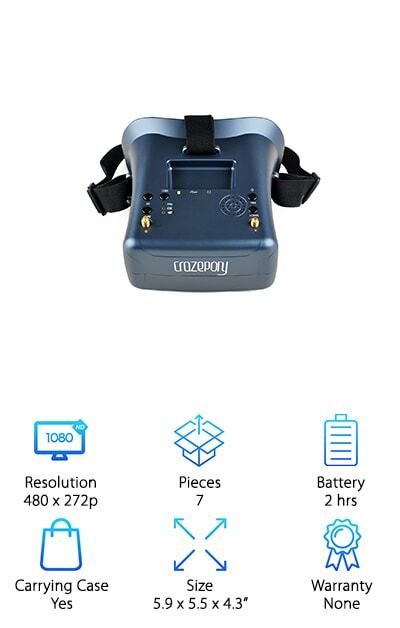 If you need something to step up your game while flying your FPV drone, you’ll need some of the best FPV goggles on the market. These goggles can help you stay in contact with your drone while it's in the air and fly it incredibly accurately. 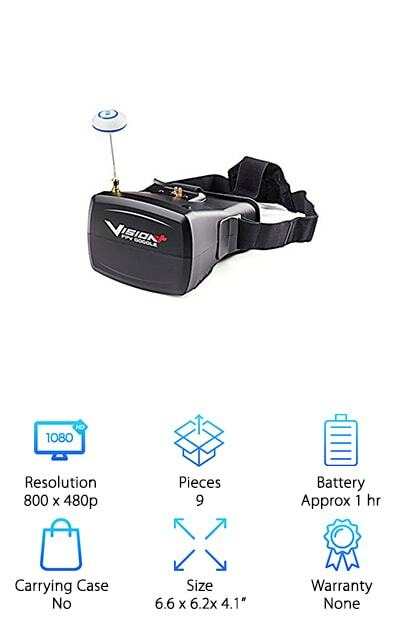 These goggles can be especially useful for racing or for people who want to really get into their drone. Resolution: The resolution affects how clearly you can see the whole picture that your drone sees. Keep in mind, the higher the resolution, the better your picture will be. Pieces: More pieces in a kit can be a great indicator of goggles that come with a lot of accessories. These can include things like carrying cases or extra antennas. Battery: The battery life can be really important to serious drone users. If you plan on heavy use, choose a pair of goggles with a longer battery life. If you’re just a casual flier, an hour or two should get the job done. Carrying Case: A carrying case can help you safely transport your goggles from place to place. Many goggles are fragile and need to be handled with care, a carrying case takes that worry off of your mind. Size: Since FPV goggles fit over your face, you’ll want to be sure you choose some that are small and fairly lightweight. This allows you to have the most comfortable flight possible. Warranty: Some of the best FPV goggles come with long warranties that help you feel more confident buying. Warranties are a great way for the manufacturer to show you that they are confident in their product. Let’s get right to our amazing FPV goggles buying guide. We’ve included ten awesome choices for you to browse through. Out top pick is what we consider the best of the best. Our budget pick is perfect for those looking for budget FPV goggles that don’t break the bank. Be sure to look through all of our amazing options. These are some of the best first person view goggles on the market. 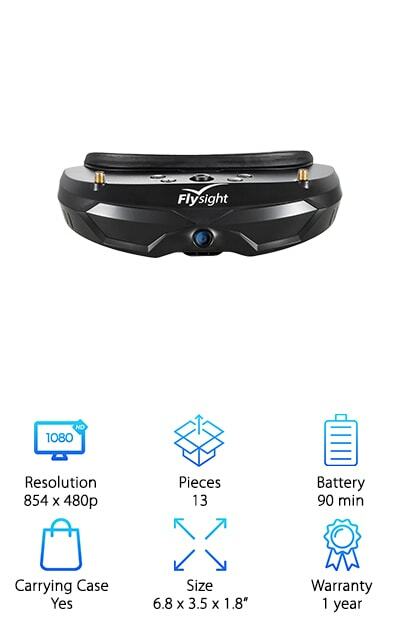 These goggles provide seamless FPV flying for your drone with their large ultra-high quality screens. These goggles are also equipped with long-range and low-lag wireless connectivity. This allows you to have direct control over your drone regardless of where you are. 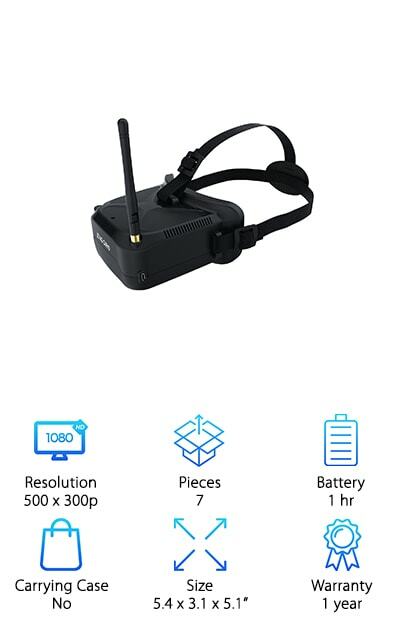 These goggles are able to offer 720p/60fps and close range 1080p/30fps viewing with an extremely low latency of just 110ms. They also allow you complete control over photo and video capture. These goggles use a beam splitter to display an image in front of each eye, as well as polarization to prevent any image overlap. This gives you the ultimate experience with a truly clear and genuine picture. You can even use Head Tracking flight mode to control your drone with the movements of your head. These goggles are comfortable and flexible, making them easy to use and wear. 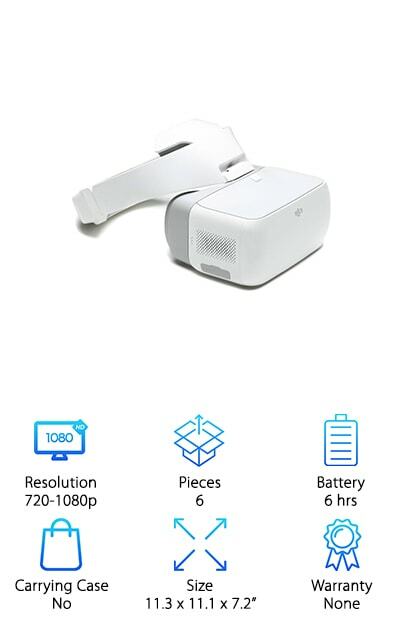 As a DJI product, they are also some of the best FPV goggles for DJI phantom. Our budget pick is a great choice for anyone looking for the best budget FPV goggles around. These goggles are versatile, and you can use them as goggles or you can separate the parts to create something new. You can separate the 5-inch screen and use it as a small monitor on a radio controller or with the tripod. it even comes with an advanced auto searching function to allow you to see the working frequency on screen. The 5-inch screen has 800 x 480 pixel HD brightness. The screen is specifically tuned for FPV racing. It has comfortable on the face so you can wear it without being uncomfortable. It comes with a rechargeable battery and each charge will last you around 3.5 hours. This makes it a great choice for casual FPV users or for people who are great about charging their goggles. This set of goggles comes with a super wide visible angle it allows you to see up to 82 degrees. These goggles buy Crazepony are some of the best cheap FPV goggles out there. These goggles come with a high brightness 4.3 in LCD. It is tuned specifically for FPV racing or model airplanes. It comes with a 2-hour battery life allowing you to keep flying for a long time. The ergonomic design is designed to fit your face perfectly. This makes it a great choice for anyone looking for a comfortable and easy to wear pair of goggles. It has a built-in and super sensitive 5.8 gigahertz receiver which comes with advanced auto searching functions the show you the working frequency on the screen. The lens is 92% and parents and offers no distortion and no blur on the edge of the screen. This high-brightness LCD is sure to leave you satisfied. It comes with a 3-way adjustable belt so you can fit it exactly to your face. These goggles are some of the best HD FPV goggles on the market today. They even come with a one-year warranty to prove it. these goggles are solid and long-lasting, ensuring you'll be able to use them for a long time. These goggles come with a unique PIP function that allows you to check your surrounding view while controlling your drone. This makes it easy to control and fly your drone knowing what's around you. The front camera can provide up to 100-degree field of view. This makes it easy to notice any dangers while in the air. These goggles have a built-in 5.8 gigahertz dual receiver that helps them to provide smooth real-time video transmission with almost no latency. If they are experiencing problems they will automatically connect to a stronger signal. These goggles provide a clear picture with 854 by 480p HD resolution. These goggles are incredibly easy to use all you have to do is plug and play. This standout set of goggles is a great choice for people looking for the best FPV goggles for the money. At the price, these goggles are a great choice for any beginner. They come with a 5-inch screen that has a resolution of 800 by 480 p. The extra comfortable sponge rubber cushioning makes it ideal for people looking for the best facial comfort. The new design of these goggles can be used with glasses so everybody can get a great picture. These goggles also have a longer focal plane range. The clear acrylic lens set gives you a superior FPV experience. These lenses come in 1.25x and 1.50x magnification. These goggles even come with a lightweight EPP foam goggle case which is designed for face fitting. These goggles also come with a lighter multi-purpose neoprene goggle glove. This case has pockets for the head tracker, camera switcher, and fully adjustable top and side head straps. 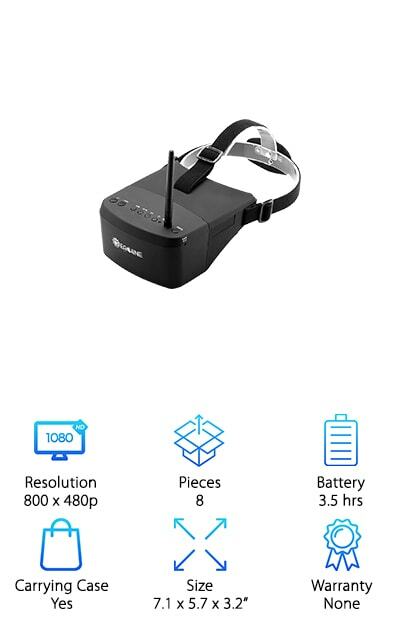 These goggles are a great pick for anyone looking for an all in one solution that doubles as one of the best drone FPV goggles out there. It comes with an integrated receiver that allows you to easily communicate with your drone while it's in the air. This pair of goggles comes in an all-in-one kit that allows you to start flying as soon as you take it out of the box. These goggles also have a field of view that is a favorite among drone pilots. It includes LiPo batteries for easy charging. It also includes an OLED receiver that is easy to use because it is just one-touch. This receiver has one-touch band change capability, channel scanning and a spectrum analyzer for clean and simple channel selection. The VGA display gives you an easy to see view of what’s ahead. These goggles are a great choice for anyone who wants amazing features. These goggles are a great choice for anyone still looking for FPV goggles with glasses. These goggles come with a 16:9 and 4:3 switchable display ratio. The field of view on these goggles is 32°. These goggles also come with an integrated HDMI port. Through this port, it can support 720p and 3D signal inputs. It even comes with a 5.8 gigahertz built-in diversity high-sensitivity module. It can also control your drone through head tracking. It can even record your favorite flights with its DVR function. It supports diopter lenses -2, -4, and -6 lenses are optional. These goggles also come with a high-speed ventilating fan. This helps to prevent fogging up on the screen. These goggles will automatically switch signal antenna is stronger. It also includes channel display on the screen. These goggles come with 2 antennas, one carrying case, 3 cables, 2 foam padding inserts, and a user manual. These are some of the best value FPV goggles out there right now. These goggles come with a high-definition field of view. This allows you to see everything as you fly. These goggles support real-time transmission through its built-in 5.8 gigahertz receiving band. This receiving band will automatically switch signals if you encounter weak service. This headset achieves real-time transmission of high-definition images every time you fly. The coolest thing about these goggles is that they support real-time standby charging. When you are out in the field you can use the product while charging it from a mobile device. Its small body makes it easy to carry anywhere you go. It is also incredibly light. The one-year warranty allows you to be confident that you were buying a great product. It also comes with an adjustable headband so it will fit anyone's head. This is a great pick for anyone looking for a budget set of FPV goggles. 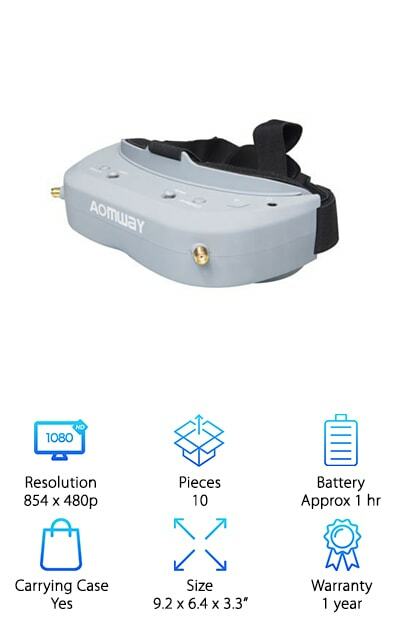 This is a great pick for anyone on the lookout for cheap FPV goggles. These goggles are the perfect choice for anyone who wants high resolution on a budget. they are plug-and-play so you can take them right out of the box and start using them. They are incredibly lightweight so you can take them anywhere you need to go. The 5-inch monitor as a magnification lens to let you get close to the action. These goggles also come with neoprene foam cushioning stripes. These Stripes help to add comfort and stability to the goggles. They also have a fully adjustable 3-position head strap that allows you to choose a configuration that is perfect for you. These goggles are made with a durable and lightweight plastic design so you'll never have to worry about buying another pair. The on-screen menu has adjustable brightness, contrast, and color controls. It also comes with a built-in 40 channel receiver. You can auto select between the integrated receiver or the external video source. 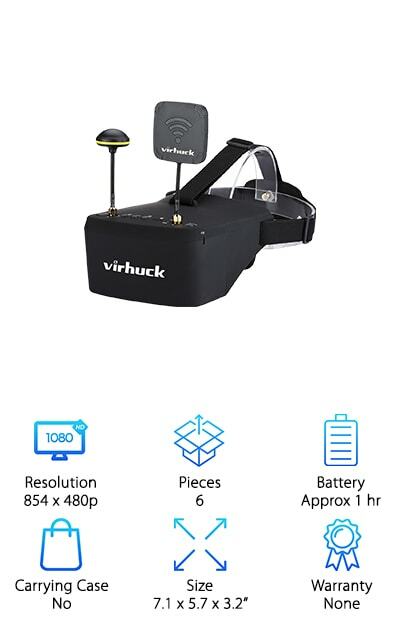 These goggles by Virhuck are some of the best FPV goggles for racing. They offer an ergonomic and practical design so they fit you well. This allows you to focus on racing and not on your goggles. These goggles come with a 5-inch screen that can be used separately as a small monitor on a radio controller or a tripod. the HD screen has 854 by 480P HD brightness and resolution. This makes it the perfect choice for FPV racing or for model airplanes. These goggles use a real-time operating system with a built-in 5.8 gigahertz receiver. That uses two types of antennas- linear and Omni. These antennas allow you to get the best signal every time. 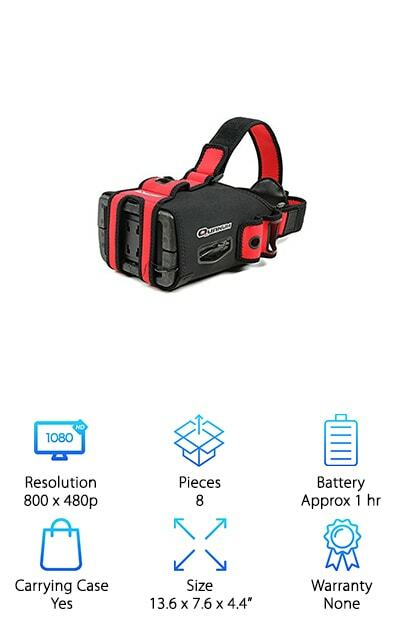 These goggles also have an auto searching function who allow you to connect to the best network. The two path receiver and help you achieve lower lag in your wireless connectivity. The view angle is super wide, up to 82 degrees.